Value and Versatility in One. 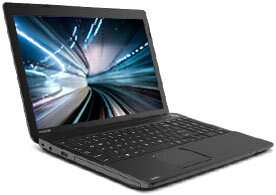 The Satellite® C55D-A5240NR fulfills all of your fundamental computing needs in an elegant, portable package. No overpriced, overhyped technologies — just the most useful features like built-in WiFi® for checking email, keeping up with social media, video chatting and browsing the web at an accessible price. 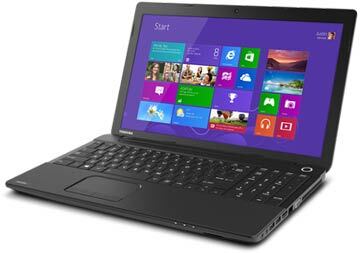 With its DVD player, 15.6″ screen, comfortable keyboard and stereo speakers, this multitasking machine will reliably meet all of your needs, whether you’re researching a project for work or just watching a movie for fun. Built-in Wi-Fi® lets you stay connected to work, play, friends and family without being tethered to a cable or cord. Turn emails and instant messages into face-to-face conversations with a seamlessly integrated high-definition webcam. Use external devices like portable flash drives to share files quickly and easily with three self-powered ports: one with USB 3.0 and two with USB 2.0. View text, photos and movies in vivid color with a 15.6″ HD TruBrite® display. The Satellite® C55D-A5240NR comes in Satin Black with a Trax texture, making it just as handsome as it is functional. 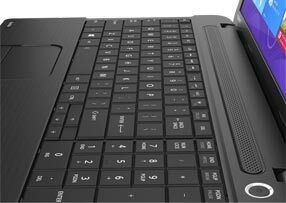 Maintain quick, intuitive control over your laptop commands with a large touchpad featuring gesture recognition and a comfortable keyboard with a 10-key extension. Watch your favorite films wherever you go with an on-board DVD drive that can also be used for sharing files and backing up your data. Enjoy enhanced audio from stereo speakers equipped with DTS Sound™. An integrated HDMI® port makes it easy to super size your entertainment by connecting to your big-screen TV. Get the responsive performance you need to run today’s most popular software applications with an AMD Dual-Core processor. Download photos from your camera quickly and easily with a convenient, built-in media card reader. Safely store and easily access all your videos, photos, music and other documents on a generous 500GB (5400 RPM) Serial ATA hard drive. ©2013 Toshiba America Information Systems, Inc. Satellite is a registered trademark or trademark of Toshiba America Information Systems, Inc. and/or Toshiba Corporation. 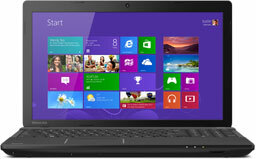 ©2013 Advanced Micro Devices, Inc. All rights reserved. AMD, the AMD Arrow logo and combinations thereof are trademarks of Advanced Micro Devices, Inc. in the United States and/or other jurisdictions. All other trademarks are the property of their respective owners. Product specifications, configurations, prices, system/component/options availability are all subject to change without notice. All rights reserved. so far so good We talked with a computer guy and this had everything we were looking for. We would’ve preferred windows 7 since everyone complains about windows 8 but really after messing around a bit with it, its not that bad if your a techy person. 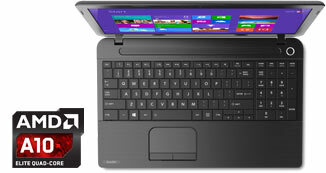 If your not comfortable with tablets and smart phones then i would stay a way a look for a windows 7 computer. This was easy to set up and it has a desktop app which is nice just missing the start button so it still is different than your usual desktop.